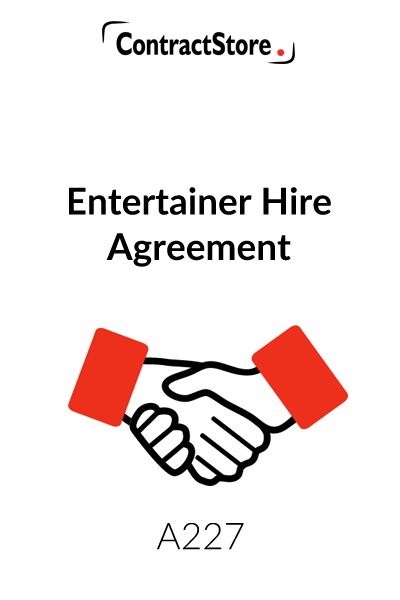 Who can use this Entertainer Hire Agreement? 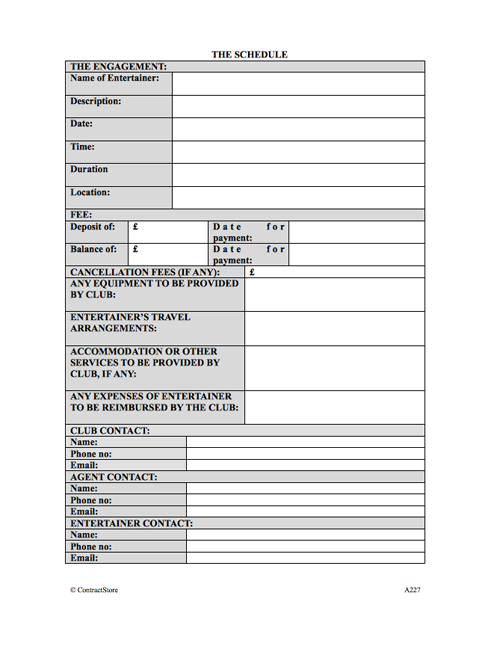 This entertainer hire agreement is for use by a club or other organisation wanting to hire an entertainer are all, comedian or similar. The terms and conditions can also be used as a basis by an entertainer or their agent when dealing with the club. 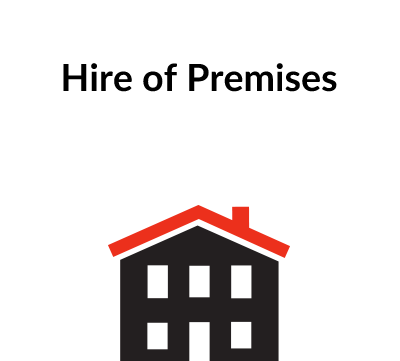 What is this Entertainer Hire Agreement for? The agreement contains a set of terms and conditions that apply between the club and the entertainer. There is also a short letter of engagement plus a schedule detailing the arrangements as well as the fees. The practical issues dealing with the performance, timing, any equipment and accommodation as well as fees and payment details in a schedule attached to the letter agreement. Under the Terms & Conditions, the agent has to make sure the entertainer complies with the contractual requirements which include arriving in good time and conducting themselves in an appropriate manner. The agent also has to ensure that any needs for special equipment are notified in good time. The host organisation has to provide the agreed equipment and facilities as well as maintain relevant insurances. They also have to take reasonable measures to prohibit any recording which might breach the entertainer’s copyright. The T&Cs contemplate that either party might want to cancel. So they specify the cancellation arrangements including timing of notices and payment implications. The agreement is written from the point of view of the club. You need this document if you are a club looking to hire an entertainer for an event at your premises, and want certainty about the terms of your agreement. This agreement is for use by a club or organisation wanting to hire an entertainer, musician, comedian etc. The agreement is in two parts: a letter agreement with schedule and related terms and conditions. This sets out the agreement of the parties whereby the entertainer’s agent agrees to provide an entertainer to appear at a club. This letter (and the terms and conditions) supersede any previous agreements or understandings between the parties. Note that the entertainer is not a party to the agreement. When there is to be a direct agreement between the entertainer and the club, the wording can be adapted so that references to ‘the Agent’ are removed and the wording adjusted to refer to the entertainer. The schedule to the letter agreement details the fee payable, date of the engagement, equipment to be provided, payment of the entertainer’s expenses and so on. This clause sets out the definition of certain words used in the Terms and Conditions. Here the agent’s obligations to provide an entertainer are set out including an obligation to notify the club of any equipment required by the entertainer. Such requirements are set out in the schedule to the letter and if not are then to be the responsibility of the entertainer. Note too that the agent is responsible for ensuring that the entertainer adheres to the terms and conditions. This is especially important in the case of clause 3. The agent should have an agreement in place with the entertainer ensuring that any losses incurred by the agent as a result of the entertainer’s breach of these terms and conditions are recoverable by the agent. The entertainer’s obligations are set out: principally to comply with the club’s reasonable instructions, regulations and to avoid the use of objectionable/obscene/defamatory material. The club agrees to adhere to applicable regulations such as those governing health and safety, to provide equipment as agreed and to maintain appropriate insurance cover. The club’s liability to the agent is limited to the amount of the agreed fee. Any loss of profit, future business, damage to reputation or other indirect or consequential losses are excluded. This clause sets out the procedure for invoicing the club. Invoices are payable within 30 days and simple interest at 3% above the Bank of England’s Base Rate is payable on monies outstanding after 30 days. Clause 6.4 makes it clear that the club is not liable to reimburse the agent for expenses except for those referred to in the schedule to the letter. 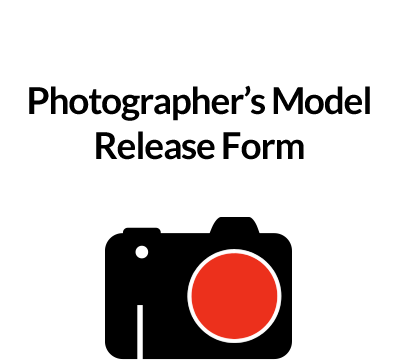 This provides for the right of the club to produce publicity material to promote the engagement of the entertainer and obliges the agent to provide photographs and other material on request. So as to protect the entertainer’s intellectual property rights the club agrees to take reasonable measures to stop its patrons from making recordings of the entertainer. All intellectual property rights in the entertainer’s material belong to the entertainer alone. Arrangements relating to cancellation by the agent/entertainer vary according to the amount of notice given. Under clause 9.1 cancellation at least 4 weeks prior to an engagement imposes an obligation on the part of the agent to find an alternative entertainer reasonably acceptable to the club. If this is not possible the agent must refund the club any fee already paid. Under clause 9.2 where cancellation is less than 4 weeks prior to the engagement or where the agent is in breach of the agreement/terms and conditions the club is entitled to a full or partial reimbursement of any fee already paid. Under clause 9.3, where the club cancels an engagement with less than 4 weeks notice and does not offer an alternative engagement date acceptable to the agent a proportion of the fee (as set out in the schedule) is payable to the agent. Where notice of cancellation is given more than 4 weeks in advance, no fee is due to the agent and any advance of fee paid is to be reimbursed by the agent. Where either party is unable to fulfil its obligations because of events beyond its control (“Force Majeure”) the party unable to fulfil its obligations is not deemed to be in breach of the agreement provided that it gives notice to the other party and makes all reasonable efforts to mitigate the effects of its failure to fulfil such obligations. Either party may terminate the agreement if the other party becomes insolvent or is in breach of the agreement. This sets out the procedure for giving notices under the agreement. The agreement is subject to English law. Disputes are to be subject to mediation but if this fails the parties agree to submit to the jurisdiction of the English courts. 14.1 Neither party may assign its rights or obligations without first seeking the written consent of the other party. 14.2 This makes it clear that the agreement between the parties consists only of the letter schedule and the terms and conditions. To ensure contractual clarity and certainty all preceding agreements or understandings are superseded by the agreement. 14.4 This clause excludes the right of third parties (including the entertainer) to enforce the terms of this agreement or to claim damages for its breach. If it is agreed that the entertainer should be allowed to enforce the agreement or to claim damages for its breach please add after the words “any third party” the words “(except the entertainer)”. In addition if the entertainer is to be allowed to enforce the agreement/claim damages for its breach then the last sentence of clause 5.1 could be removed.